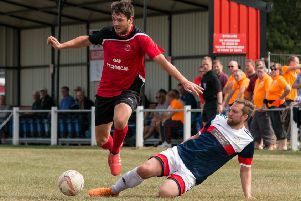 Leaders Teversal bounced back from a midweek East Midlands Counties League defeat — their first in 11 matches dating back to 28th October — to claim a 2-0 win at Arnold Town. Manager Dean Short would have been pleased with the response to the loss to Birstall United. Matt Wilkinson lobbed wide early on and Jordan Slack, making his first start, was denied by the impressive Ben Hunt. Khyle Sargent’s curling effort towards the back post was tipped away by Keaton Sharpe, who dived full length to tip the effort around the post. The best chance of the first half came around the half hour mark when Slack again got to the by-line before picking out Gary Atkins, who was denied by a superb point-blank save from Sharpe. Aaron Pride headed a Dave Cockerill corner against the bar as Tevvie started the second period on top. Just after the hour Teversal substitutes Danny Fletcher and Kurt Bamford came on and helped to win the game. In the 78th minute Slack’s cross was headed back across goal by Fletcher to break the deadlock. Three minutes from time Bamford raced clear on to keeper Josh Turton’s ball to calmly pass past the keeper and into the empty net.